Bio: Melina Theocharidou is a multilingual, London-based actress. Native Greek and English speaker with excellent French and Italian also. She translates from Greek, Italian and French into English and from English, Italian and French into Greek. She is also a specialist adviser on the pronunciation of Greek-derived words in English and has consulted on Warner Brothers' 300: Rise of an Empire. 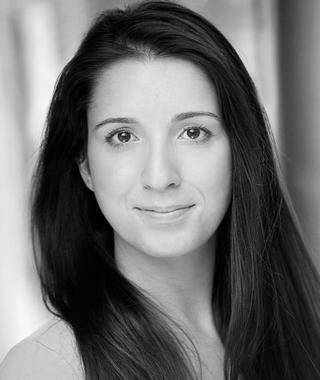 Melina’s voiceover credits in English include corporate clips for Ernst & Young and Gatehouse Group and the Water Works campaign for Wateraid. Description: Melina’s calm, clear and engaging voice is perfect for corporate, documentary and audiobook recordings. Her commercial tone is full of youth, glamour and exuberance, excellent for product campaigns. Her natural accent in English sounds European (you can't place her ethnicity) and is therefore an ideal match for campaigns, documentaries and audiobooks with a continental focus. Melina has native speaker accents and fluency in English, Greek, French and Italian. She can also perform in English with a Greek, French and Italian accent.